With this horse feeder less hay lands on the ground. Mounts easily on wood, or pipe fence, or stable wall. Designed to keep hay and feed in the feeder. Lidded storage compartment helps keep hay fresh and dry.. This long-lasting unit will be will become your horse’s best friend at feeding time! Easy to clean, nothing to maintain. 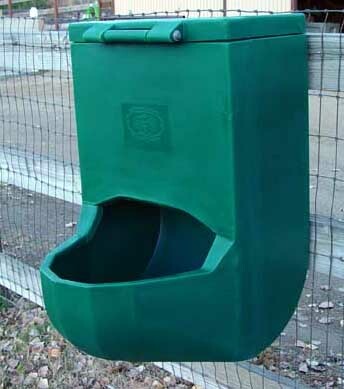 Impervious to weather and corrosion proof, the Sure-Feed Horse Feeder stays clean. Drain holes are engineered in the basin for run-off of rainwater. It will provide years of service. Material will not crack or fracture and it is chew-resistant too! All feeders come with One Year Unconditional Warranty Against Breakage. The large storage compartment will hold more than two flakes of hay. The smooth interior allows the hay to gravity fall into the feeding basin. The lid fits tightly with a full 1 3/4" overlap. The lid will not bend and has no sharp edges. The extremely massive hinge is integrally molded into the lid and feeder compartment and not simply added on. This plastic stall feeder may be mounted on pipe rail fencing. Edges are smooth shaped and curled under inside to help prevent feed and hay from being flipped out. Horses can easily reach hay as it is gravity-fed from inside; however, the unique design prevents them from pulling all the hay out at one time. Grain cannot be pushed up and out and is easily cleaned up by horses from the extremely smooth basin bottom. Molded in One Piece from Polyethylene Plastic Strong, rugged one-piece construction that will last and last. Polyethylene outperforms steel. That is why this super-tough plastic is the material from which many truck and off-road vehicle gas tanks are made. It will not rupture under severe stress. It will not lose its shape or finish. Its sun resistant with a special ultraviolet stabilizer. Its cold resistant, remaining pliable and strong under heavy impact at 40 below zero. It is the toughest material for ranch related use. 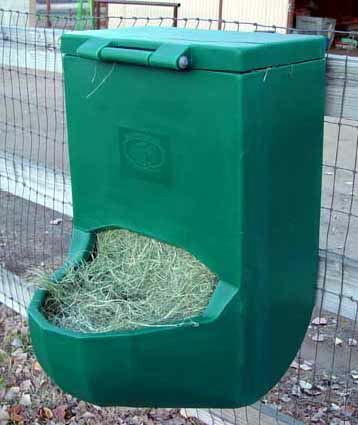 Depth of Basin: 10 1/4"
The Sure-Feed plastic horse feeder is the ideal way to keep hay up off of the ground. Designed to keep hay and feed in the feeder, is able to hold more than two flakes of hay. Edges are smooth-shaped and curled under inside to help prevent feed and hay from being flipped out. Horses can easily reach hay, as it is gravity fed from the inside: however, the unique design prevents them from pulling all the hay out at one time. Mounts easily on wood or pipe. It will not lose its shape or finish. It is both sun and cold resistant, made of the toughest material for ranch related use. Easy to clean and maintain. Lidded storage compartment. Used in equine veterinarian clinics. Feeding a horse on the ground can serve to stimulate allergies and respiratory problems. When hay is placed on the ground the horse may end up eating lots of dust. When a horse consumes dust while eating dusty hay off the ground, it is a common way of causing and developing respiratory problems. Horses that live in large boarding barns are especially at risk of developing a respiratory virus from eating dusty hay from the ground. If a horse has to eat hay of the ground where it comes into contact with urine-soaked bedding that is another way for the horse to develop either a respiratory problem or allergic reaction. The feeder should be mounted at chest level to enable the horse to eat with the head down. When the horse eats with his head down, it enables him to free dirt and dust from the airway and nostrils as opposed to inhaling dust deep into the lungs. Another reason to avoid allowing the horse to consume a lot of dust is that as horses get older their digestive system may not work as well as it used to. Horses cannot digest dust and dirt. Their presence in the feed makes absorption of nutrients from hay and feed much more difficult. SURE-FEED Horse Feeder What drove us to design, manufacture and market the Sure-Feed horse feeder? Our feeders are custom-designed and manufactured here in America. We designed them through trial and use to be the best feeders that money can buy. These feeders are built with heavy-weight plastic. They are not cheap foreign copies, as many of the products we are seeing these days dumped on our shores at bargain basement prices. Yes, it is possible to purchase a cheaper feeder made out of substandard material using super-thin plastic that will crack at the first application of minor stress or cold temperature. 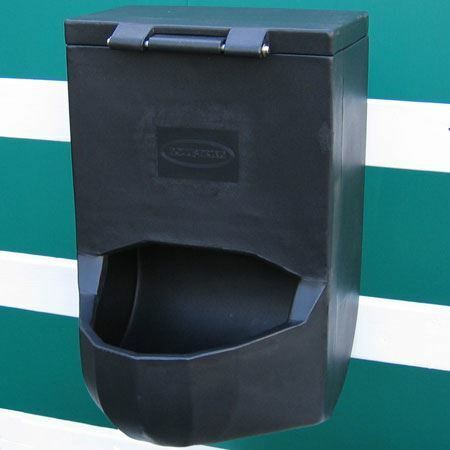 Our feeders however are heavy-duty and extremely resistant to cold. They are heavy to lift and difficult for any horse to damage. The thick plastic we use makes them that way –tough –guaranteed! One horse feeder we tried was made out of sheet metal with metal bars to retain the hay. We heard one story about a horse that got its jaw caught between the bars of a metal feeder such as this, and the result was severe damage to the horse. This possibility, certainly remote, started us thinking that we could create and manufacture a feeder using our own design that solved this potential problem. Se we set out to make the best stall feeder on the market. We started looking into designing, manufacturing and marketing a safe, plastic wall or fence mounted feeder that fit all our requirements. We knew that if we were successful, other horse owners experiencing the same problems we had would love the idea. Way back in 1987, we owned many horses. We looked for the best and most economical horse feeders available on the market. We wanted a feeder that would be safe for our horses – with no jagged or sharp edges, while doing its best to keep the hay off the ground. We looked at various plastic bins and tubs, both fence and wall-mounted, as well as some that sat on the ground. We searched everywhere, in places like our local tack stores and various catalog stores. We were unable to locate a feeder that fit all the criteria we were looking for. We wanted a feeder that was safe, economical, made out of plastic with the capability of being mounted on a wall or fence. There was nothing on the market that fit that criterion. The first Sure-Feed model was a corrugated paper model, designed in 1987. This first model closely resembled what was to become the finished feeder we manufacture and sell at Equuspring today. It had a large bowl to retain the hay for the horse to eat from, along with a large area to contain the hay with a hinged lid that would keep hay away from the horse until they pulled it from below into the bowl. The level of quality we offer with every unit we sell is very high. We are so concerned with quality that we are willing to back up our commitment with a 1 year guarantee. Can you afford not to purchase a Sure-Feed horse feeder? How did we achieve our goal of creating the perfect horse feeder? A covered storage area was incorporated into the design. 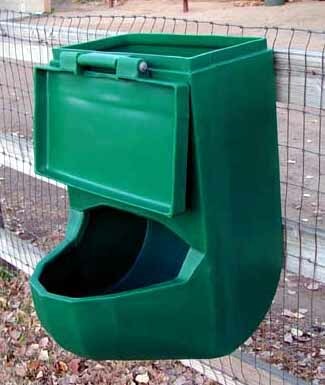 The lid hinged in front overlays the top by over 1 ½" making it difficult for horses to open. The design forces the horse to access the hay from the bowl area. The bowl has a nice access with gravity releasing the hay as it is consumed. The height of the feeder from the ground is dependent upon the size of the horse. The horse’s nose should be pointed down when eating out of the bottom of the bowl. We designed the inside of the feeder to be shiny-smooth and almost slick which makes it easy to clean with a damp cloth or sponge. Personnel at veterinary hospitals like the ease of cleaning and disinfecting, if required. The lid and all surfaces have no sharp edges. All the corners have been rounded off during the manufacturing process. The feeder comes with a small hole in the bottom of the bowl, for draining purposes. The holes may be enlarged by the end-user as requirements dictate. 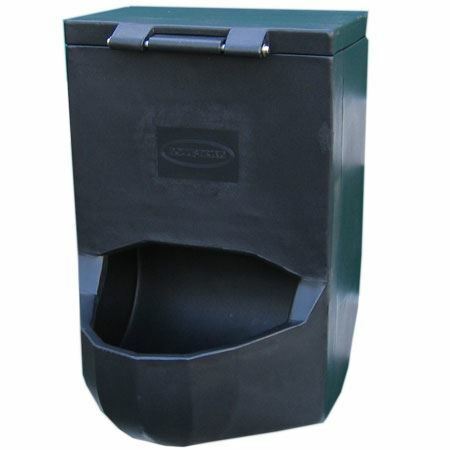 Each feeder comes with two metal pipe hangers and hardware for mounting to pipe fencing.